Heat oven to 350°F. Remove and discard unpopped kernels from popped popcorn. 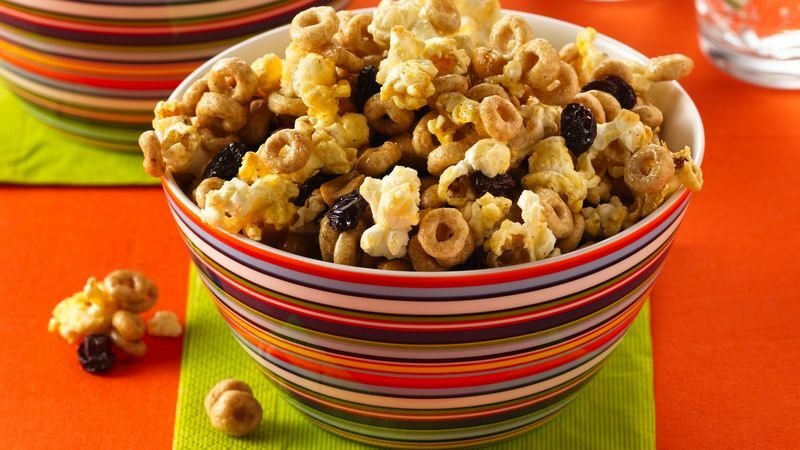 In large bowl, mix popcorn, cereal, peanuts and raisins; set aside. In 1-quart saucepan, heat corn syrup, honey, butter and cinnamon to boiling. Remove from heat; stir in vanilla. Pour over cereal mixture; toss until evenly coated. Spread in ungreased 15x10x1-inch pan. Bake 15 minutes, stirring occasionally. Cool pan on cooling rack, stirring occasionally. Store loosely covered. Cinnamon-Oat Snack: If you're not a peanut fan, omit peanuts and increase cereal to 6 cups.